Johnny Cantor: What effect will EU exit have on Albion? In or out. It’s been decided. We’re out of the European Union. The fallout politically has been incredible. There is a new PM in place. I’m no economics expert but I assume we will only be able to assess the economical fallout in years to come, good or bad. So, what about the impact on football? I guess to a certain degree the sport is still digesting the implications and any major alterations may not come into play for another two years. On BBC Sussex, I spoke to football finance expert and Albion fan Kieran Maguire, from Liverpool University, who gave his initial reaction to the news. In general, he felt the fall in the value of the pound would mean the price of players from abroad will be higher, citing clubs like Juventus. According to research, 65 per cent of players in the top flight are from abroad, however the blow of higher prices will be cushioned by the new TV deal so many may still be prepared to pay top dollar, (well pounds or euros!). On the flip side, according to Maguire, English players will be more valuable but the reluctance of UK players to head abroad is unlikely to change in my view. Wages are often a key factor here. Another issue for attracting players here is work permits. There is still a period of calm before Article 50 is invoked but if the current rulings for players outside the EU are adopted for those inside it, clubs such as the Albion would not have been able to take individuals such as Leo Ulloa, Bruno or Inigo Calderon due to their lack of international appearances – a figure that is based on a country’s FIFA ranking. It’s certainly food for thought. It will certainly be challenging times for Championship clubs. The Seagulls’ Category One status should help them face those challenges but it is still to be seen whether many of those younger players can make the grade after moving up through the system. Brighton & Hove Albion have already signed Ben Hall from Motherwell and Fleetwood Town defender Tyler Hornby-Forbes. These deals are maybe more about the changes to the loan system that come into play this season but if they can make the transition from the under-21s it will have been a smart move. I expect them to feature in the EFL Cup, so we won’t have long to find out. You would hope the promotion of young English talent in the Football League may help strengthen the international set-up but there is of course no guarantee. We are already seeing the impact of the vote on parliament and Number 10 but it seems the implications for football may be somewhat further down the line. 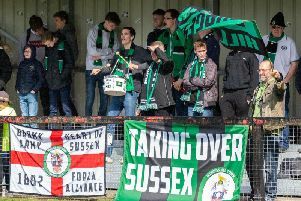 The Seagulls have themselves had a fairly turbulent few years with changes at the helm but supporters may be happy that their leader looks set to stay and their cabinet are planning for the future. I’m never sure if it was Benjamin Franklin who said ‘we live in interesting times’ but he is accredited with the thought that ‘by failing to prepare, you are preparing to fail’. Mind you, he’s also thought to have muttered ‘In wine there is wisdom, in beer there is freedom, in water there is bacteria.’ so maybe we are better off just biding our time!